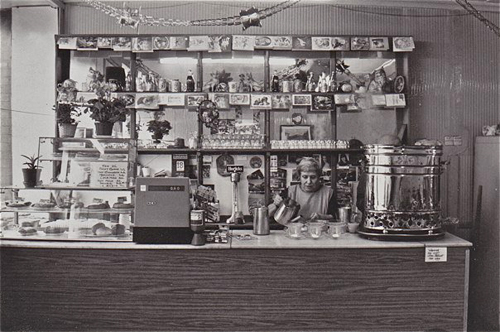 Ex-Crossfields resident Peter has sent us some old pix of Lou's Cafe (see previous post). Like a great many others, Pete used to hang out at the caff when he was younger. He now lives in Rochester down the road from Josie's nephew so has kept in touch with the family, as well as Crossfields and Deptford. 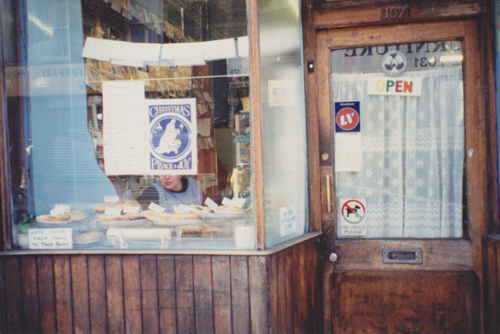 Pete says, "This was by far my favorite cafe in Deptford, run by Josie, her brother Lou and his wife Polda (who cooked). It was all home cooked food, and home baked cakes . The urn on the right just bubbled away all day. Sadly it closed because of illness, a fraction short of 60 years in family business. This is a Christmas time shot and it's the early to mid 80s. The shop became Josie's home and I visited every now and then, and if I was very lucky there was home-baked rock cake on offer...Sadly now, Josie has joined Lou and Polda in the Great Cafe in the Sky..."
Anyone with information about the arson attack that led to Josie's death is urged to call the police incident room on 020 8721 4961 or Crimestoppers, anonymously, on 0800 555111. The high street felt somewhat blighted today, not only with bad weather and endless roadworks disrupting trade and shopper's movements, but also with the sad news of the death of 82 year old Giuseppina Fazzani in a fire at Lou's cafe, which occurred in the early hours of yesterday morning. 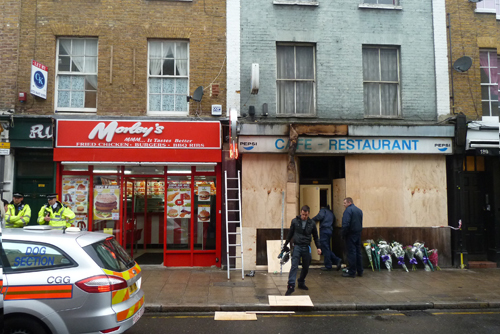 There was a high police presence at that end of the street as they investigate what they now believe to be an arson attack, with evidence that an accelerant was used to start the fire on the cafe and the Vietnamese restaurant next door to it. The Fire Brigade managed to save the life of a second woman who lived on the first floor, and the Deptford Dame, who broke the story yesterday morning, points out that if the proposed closures of our fire stations go ahead, she may not have survived. 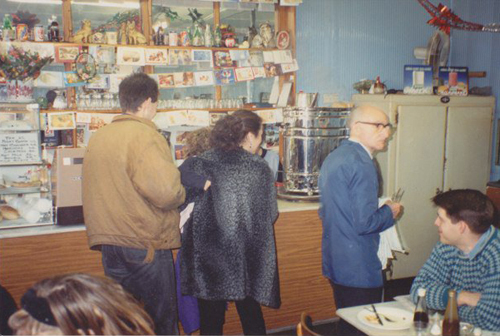 Older residents will remember Giuseppina from when the cafe was a popular haunt before it closed around 20 years ago – it was also quite a creative hub for local musicians, artists and activists. Friends and family have been leaving flowers. Meanwhile, at the other end of the street, van loads of coppers descended on Corals, Paddy Power and Ladbrokes in what is thought to be a drugs operation. 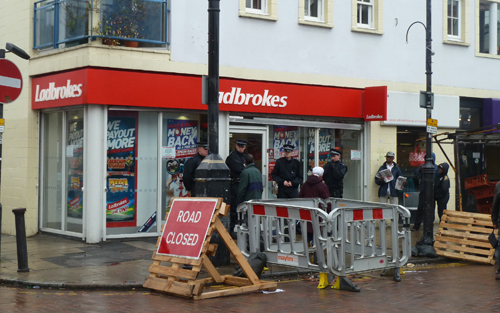 William Hill and Jennings seem to have escaped the raid. A staff member at William Hill's said, "We only sell bets here...". 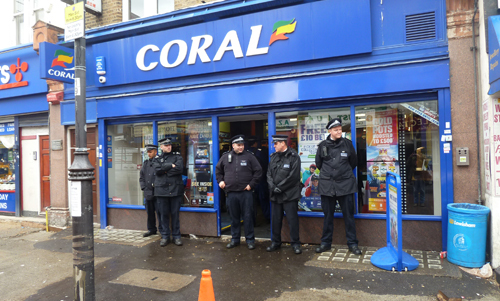 Of course, despite these bookies breaking the terms of their licenses by "being associated with crime and disorder or being used to support crime" (Gambling Act 2005), it'll be business as usual tomorrow, no doubt. See next post for Crossfields' remembrance of Josie. 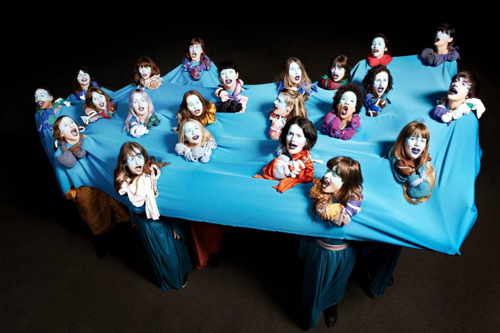 Gaggle are a 20-strong all-female alternative choir. They'll be resident at In-Situ, the new arts and events space next to the Royal Albert pub, for three weeks (12-8pm daily and till 11pm on Sat & Sun), opening on Thursday 30th May at 6pm. The girls have turned the space into a gallery and hangout space and will be selling artwork, clothing and music, and running a workshop programme of 'life and music skills'. Crossfields resident Sarah is part of the choir and says, "We're calling it the GAGGLE CAVE and we'll be putting on talks, performances and artists-in-residence along with selling products and holding dozens of workshops that we hope will empower and enthuse people – from Sound Engineering for Girls and Feminist Choirs for Boys, as well as other skills from drumming to welding! The aim is to be as affordable and accessible as possible and we hope it's going to be an exciting few weeks." Gaggle were busy painting the sign above the shop yesterday which reads "Adventures in lifestyle, craft and noise"...and will be performing on Thursday evening at 7.30pm. To find out more go to www.gaggle.tv. Gaggle also have a Facebook page, as do inSitu. 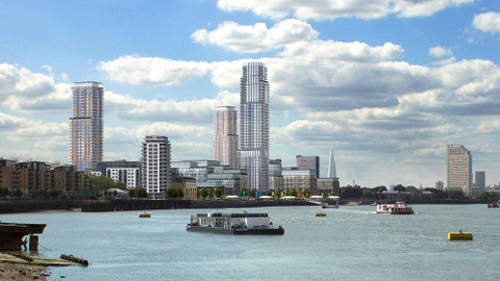 The Government Planning Inspectorate will shortly be examining the application from Thames Water for development consent for the Thames Tideway Tunnel. The proposal for Deptford involves taking over the green area between Crossfield Street and St Paul's Church as a worksite to build an access tunnel to join the main storm tunnel that runs under Deptford Church Street. This site replaced the previously preferred site near Borthwick Wharf where the spoil from digging up the green could have left by river, but will now instead clog up Deptford Church Street with construction lorries. There will also be a tunnel bored under Farrer House lawn that will run to the main storm tunnel from Greenwich Pumping Station. 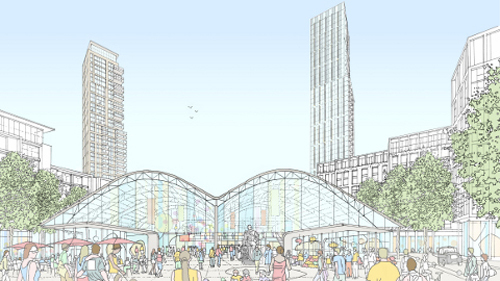 Update 24th May: Readers may wish to know where Lewisham Council stands. On the registration page, there is a tab marked "Adequacy of Consultation" which lists ten (so far) borough council's comments, including one from Lewisham in which the Head of Planning states that Lewisham has serious concerns regarding the adequacy of consultation and does not consider the applicant (Thames Tunnel) has met its duties, concluding that the application should not be accepted. See Lewisham's report here. Apart from Hammersmith & Fulham and Lewisham, there are some very complacent voices here, so yours needs to be added. Meanwhile, campaigners in Shadwell are organising an event in their local park over this coming Bank Holiday weekend (backed by Tower Hamlets Council) to help get public backing before the registration deadline. They have built replica ventilation shafts to illustrate to locals what Thames Water intend to do at King Edward Memorial Park. East London Advertiser has the story. Undertake through a red light in a bus lane, kill a cyclist, drive off and put the family through the torment of a trial = 4 years. In the hands of Barry Normah, a car is a more dangerous weapon than a handgun. 4 years for killing? THE Woolwich uncle of a teenage cyclist killed in a Deptford hit-and-run says he is "extremely disappointed" at the driver's four-year sentence and has called for more cycle lanes. Barry Normah, 28, of Watergate Street, Deptford, sped through a red light and knocked down former Addey and Stanhope pupil Olatunji Adeyanju last March, as the boy crossed the road with his bike. Olatunji, known to friends as TJ, suffered major head, chest and abdominal injuries in the Deptford Church Street accident and later died in hospital. Normah, who paused for a short while after the accident before driving off again and dumping his car, was found guilty of causing death by dangerous driving at an Old Bailey trial. At Woolwich Crown Court today (May 24) Normah was sentenced by Judge Christopher Kinch to four years in prison. But speaking afterwards, TJ's uncle and carer Steven Gisanrin, aged 46, said: "There are no words to express the pain we have suffered since that day and we are not only angry that Mr Normah chose to compound our grief by denying his actions and putting us through the ordeal of a trial, but also extremely disappointed in the length of the sentence he has been given. "Now that the criminal proceedings against Mr Normah have concluded, we as a family can hopefully begin to move on with our lives." The 46-year-old said: "TJ was a popular, charming and exceptional young man with huge potential. "TJ’s warm cheeky smile and friendly nature endeared him to everyone he met and he was loved and respected by all who knew him. "Although he will be sadly missed, we as a family take comfort in the fact that he has left us with so many positive memories, and his contribution to our lives will not be forgotten." He added: "If any good is to come from the tragic death of Olatunji then more needs to be done to promote safer cycling in the capital. "Residents in Deptford have often complained about how unsafe they feel whilst cycling in the area and are again calling for more designated cycle lanes to be installed, particularly on and around Creek Road." Eleanor Sykes, of Fentons Solicitors LLP, said she the firm was now representing Mr Gisanrin in civil proceedings against Normah. She said: "We are pleased the criminal proceedings have now come to an end but as the civil case on behalf of Mr Gisanrin is ongoing, it would be inappropriate to comment further at this time." If you're about this bank holiday and like a bit of poetry, there's an event happening on Sunday at McMillan Herb Garden (just off Creek Road, opposite Deptford Church Street) called Poems for Roderick. 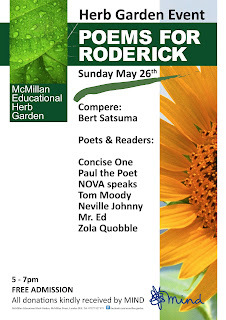 The FREE event is dedicated to Roderick Johnny who died last October, and features lots of local performing wordsmiths. All donations kindly received by MIND. More details in a post by Deptford Misc. 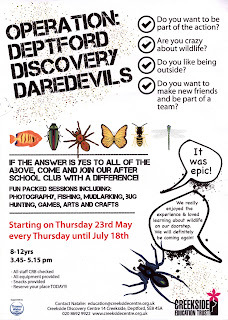 A FREE After School Club for kids aged 8-12 years has just started at Creekside Centre. It will run from 3.45-5.15pm every Thursday till July 18th. Activities include photography, fishing, mudlarking, bug hunting, games, arts & crafts and offers the opportunity for Crossfields kids to stay outside and play in a safe CRB-checked environment. Equipment and snacks are provided too! 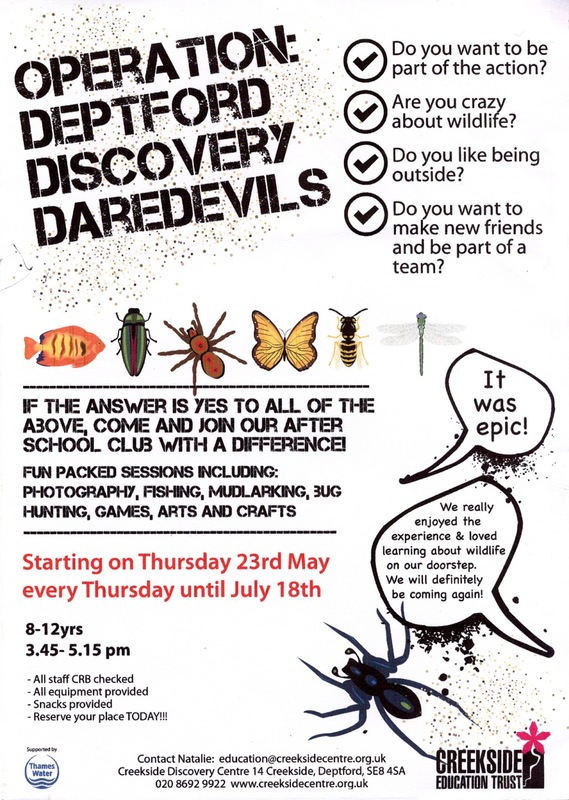 Contact Natalie to book a place on 020 8692 9922 or email her at education@creeksidecentre.org.uk. Plus! HALF TERM FISHING TRIPS! Next Friday May 31st kids are invited to don their wellies and go fishing in the Creek. From 10.30am-midday is for 5-7 year olds, preferably accompanied by an adult – there are plenty of crabs to be caught at this time of year. From 1.30-3pm is for those aged 8 and over who will get kitted out in waders so that they can fish further upstream. Cost is £5 per person (or £15 for a family of 4). Book on 020 8692 9922. More info on holiday workshops at Creekside Centre on their website and also find a list of free events here. Thanks to East London Lines for their research on this. We had done quite a bit ourselves, but were stumped by being unable to come up with hardly any information on two of the candidates, Florence Noesesbe and Mendora Ogbogbo, whilst the other contenders hit the ground running with websites specifically devoted to their candidature. So we held back and hoped some other proper (albeit equally unpaid) journalists would do their job. Twitter followers will know the results later today of whom among this all-women shortlist will be chosen to stand for Deptford when Dame Joan Ruddock stands down at the next general election in May 2015 (if the present government doesn't collapse before that). Meanwhile, you can check out the East London Lines' round up to read the biographies, and if you're signed up to SoundCloud you can listen to them speak as well. 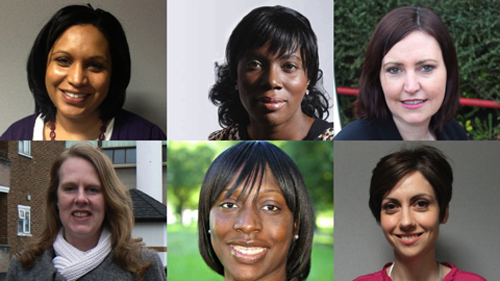 We hear that Vicky Foxcroft (top right) is favourite, but have very little evidence to go by except that she's made a good stand for Lewisham Hospital. Janet Darby's experience is in families and children, and she (top left) seems equally worth a vote if we had one, which we don't. These two are already Lewisham Councillors. 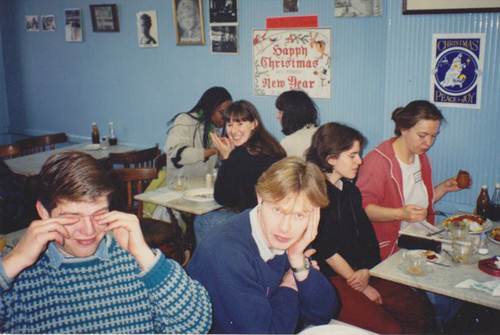 Catherine McDonald (bottom right) is a Southwark councillor with experience covering many issues. Florence Nosegbe (bottom middle) is a Lambeth councillor with experience in tackling youth crime. Mendora Ogbogbo's business is training people in how to do politics and influence policy at Westminster (top, middle). We've recently been impressed by Paula Hirst (bottom left) whose experience is in regeneration and is the only candidate to respond to the news about Convoys Wharf, the largest ever private development to impact on Deptford. Not that an MP-in-waiting can influence how Lewisham Council allows 'regeneration' in Deptford to develop when decisions must be made this year, but at least she shows some recognition of the damage that can be done. Vicky Foxcroft selected next Labour Parliamentary Candidate for Lewisham/Deptford. 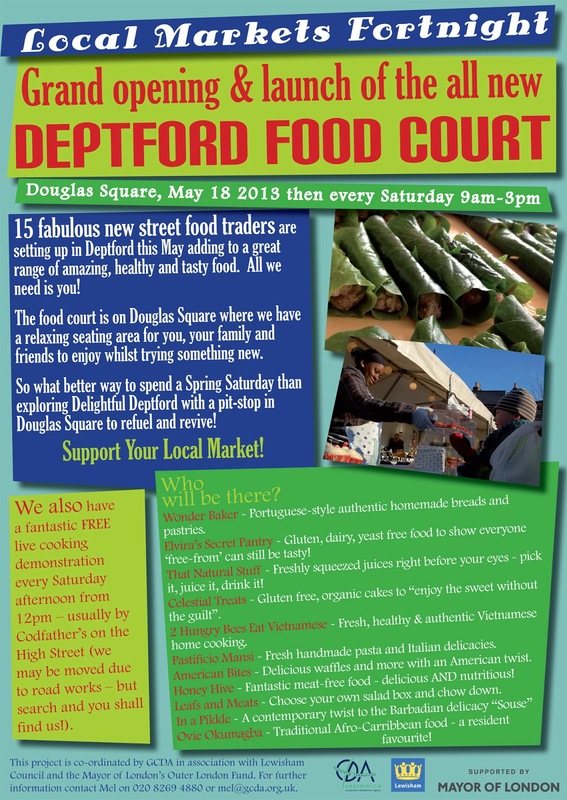 As part of the Love Your Local Markets Fortnight (and the Deptford 'regeneration' programme) Greenwich Co-operative Development Agency have been training up new street food traders, and they will all be trading on Douglas Square every Saturday (9am-3pm) starting on 18th May. The idea is to get a regular food court in the square, with somewhere to sit and eat, and make Deptford a food destination. (Click on the image to see the range of food stalls). There will also be a live cooking demonstration by Nioamh Convery every Saturday at around midday (usually by or near Codfathers). 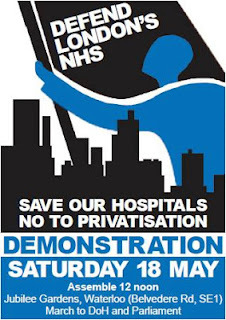 Closures planned across the capital include nine A&Es, a number of maternity units and thousands of hospital beds that will put lives at risk. Hospitals and community services are also threatened with take-over by multi-national private companies. 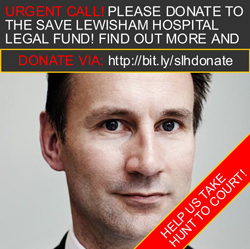 The Save Lewisham Hospital campaign URGENTLY need to raise £20,000 to support their legal challenge to the government. Their judicial review will take place on 2 July. The legal action claims that the decision to downgrade and close services at the hospital is unlawful as the Administrator’s powers (and therefore the Secretary of State’s too) related to South London Healthcare NHS Trust only and did not extend to the Lewisham Trust. Their judicial review is complementary to the Council's judicial review. Also see Lewisham Council's Legal Challenge Fund. Convoys Wharf has been in the news this past week as developers Hutchison Whampoa and architect Terry Farrell announced the submission of their masterplan to Lewisham Planning. Thanks to East London Lines who also covered the story for the pictures above and below from Farrells. A puff piece in the Evening Standard's property pages failed to refer to a wholly critical Evening Standard article written by architecture journalist Kieran Long back in 2011. As campaign group Deptford Is... point out, much of the coverage was regurgitated from a press release. They highlighted Building Design's criticism that the development gives little back to the community. Meanwhile, Paula Hirst, a regeneration expert who is one of the candidates selected by the Labour Party to take over from Joan Ruddock (results to be announced next week) wrote in Estates Gazette that "in developing a scheme that faces Canary Wharf rather than its hinterland, Farrell appears to be giving local people a clear sign that this is not for them...this is pure real estate development and represents everything that is wrong with our property industry...what Deptford needs is not more high-density housing in an area of existing high density, putting more pressure on existing infrastructure. What's needed is more open space, free to enjoy access to the river, and new employment opportunities that go way beyond construction." Read Hirst's article in full (or see Deptford Is... who have now republished the article). The Grade II listed Olympia Shed is dwarfed at the centre of the development and is vaguely intended for retail use. When the site was the Royal Naval Dockyard (1513-1869), ships were built under its canopy (as well as in other docks on the waterfront) and floated out into the Great Basin in front of it and then into the river. In the new masterplan, the Great Basin will be a shallow water feature over half its original size. 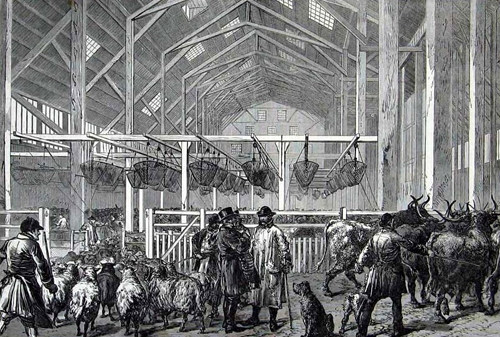 From 1871 till 1914 the Olympia Shed was used as a Foreign Cattle Market, where over 4 million head of live cattle and sheep were landed and traded. 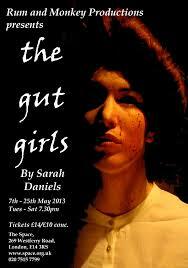 A glimpse into that period can be had in Sarah Daniel's play The Gut Girls, presently being performed at The Space in Westferry Road E14 (a short hop on the DLR to Mudchute station). The show runs till 25th May and revolves around five feisty Deptford women working in the gutting sheds of the Foreign Cattle Market. It was first performed at the Albany Empire in 1988, and has since been seen all over the world. In 2002, local theatre group Freakshow performed the play at Convoys Wharf itself. This video promoting the British Lions 2013 rugby tour to Australia (that keeps popping up on the telly) features the team pretending to be the crew of the Endeavour on Cook's first expedition to the south Pacific ocean in search of 'unknown southern land' to echo the sporting challenge they are about to embark on. In reality, the ship in the trailer is most likely to be the Rose, a replica ship which was used in the film Master and Commander, which the advert also parodies. The replica ship is American-built and Russell Crowe tried to buy it after filming finished! HMS Bark Endeavour was fitted out at Deptford in 1768. Cook's third voyage (1776-1779) was on HMS Resolution, which was also fitted out at Deptford, along with the most advanced navigational aids of the day. The dockyard was the epicentre of technological advance at this time. Just a small part of the enormous heritage of shipbuilding at Deptford Dockyard that is being totally ignored by the proposed development at Convoys Wharf. Local project Build The Lenox hopes to celebrate this history by building a replica ship in the place it was originally built – in a restored dock on the site. The dock in question cannot be built on so is presently included in the masterplan as a flattened park area. The Lenox has been chosen by the shipbuilding project because it is one of the few ships of this time for which all the plans and details needed to build it are available. It was also the first in a massive naval shipbuilding programme begun in 1677 which was managed for Charles II by Samuel Pepys. The project wants to partner with other organisations involved in training and education, and also plans an interpretation centre that could become Deptford Dockyard Museum, as an annexe to Museum of London Docklands and Greenwich Maritime Museum, kick-starting Lewisham's tourism strategy for the only bit of Thames waterfront it has. Part of the Lenox vision also includes lobbying for the establishing of a Marine Enterprise Zone on the protected wharf on the westerly part of the site, which could provide further jobs and training. 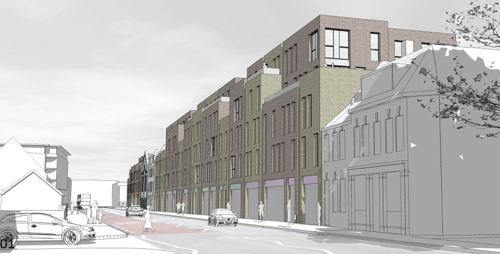 Proper and full commitment from the developer to the Lenox Project and to the other local project, Sayes Court Gardens (which aims to create a public garden and research centre on the site of John Evelyn's 17th Century garden) to allow the projects in the places on the site where they are most assured of success is still waiting to be negotiated. Both projects offer extraordinary opportunities in modern and transferable skills training that go far beyond the developer's offer of jobs in retail and construction. 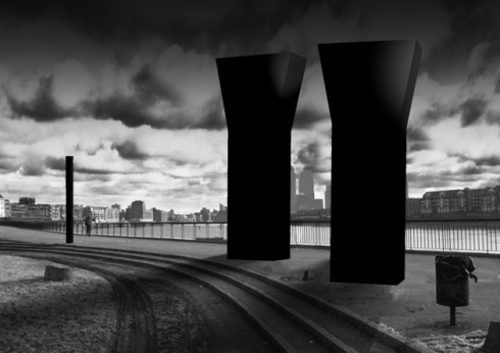 These projects need your support if you want to stop Deptford's "incredible history" (Sir Terry Farrell) being buried in a "millionaire's waterfront playground" (Joan Ruddock). Farrell said "we feel we have a scheme that strikes the right balance between respecting and celebrating the cultural heritage", but it would appear his only method for achieving this is by naming a 46-storey tower after Sir Walter Raleigh. Also see Joan Ruddock's address to the Naval Dockyards Society Conference at the National Maritime Museum on 20th April 2013. The Harp of Erin has seen better times. Full of history, it is now a pub that beer snobs Fancy A Pint and Beer in the Evening wistfully regard as one of the last pubs in Deptford High Street not worth going in (there is only one other, The Swan, whose Vietnamese owners don't have real ale on their agenda). 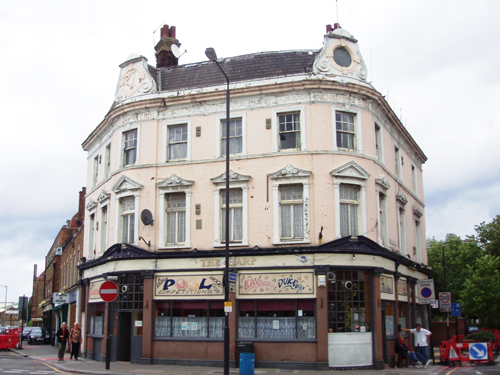 The Deptford Dame, in her post Deptford pubs added to local listing shows "The Harp" appearing as one of many pubs the Council has identified to be added to a list of heritage assets to be protected. It recently appeared on the market as a lease worth £24,000 pa with estate agents Cannon Kallar, but has been removed. It may be sold, under offer or temporarily withdrawn. A notice seen in a window of the pub suggests the game is on privately. Since there would be no need to change the planning class of this premises to turn it into a BETTING SHOP, we think Lewisham Council and EVERYONE should keep a careful eye on this. Betfred is still waiting for an 'in' to the Deptford High St gambling enclave, and Paddy Power's recent takeover of McDonnell Racing is hardly making an impact (they can't be much pleased with looking like a likkle sweet shop opposite the church). We'd like to point Lewisham towards the progress of Newham Council's present battle with Paddy Power. 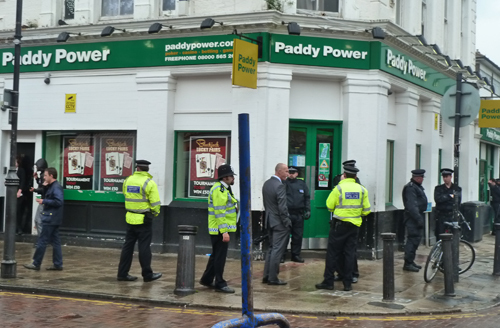 Newham refused Paddy Paddle'o'Shite a license on the grounds that the operator was making more money out of gaming machines than ordinary betting (which they are). But as usual, the £multi-billion gambling operator has appealed, so Newham is now facing a test case in the high court, the sort of case that Lewisham have hitherto avoided. Crosswhatfields campaigned tirelessly against Betfred being the 8th bookies to enter Deptford High Street all through from Jan 2011 till June 2012, but the only thing that saved us was someone clever (but rather slow-acting) in Lewisham Council who came up with an old planning clause about the use of the premises. Let's hope The Harp is now equally protected. Please read this timely article in The Independent by Mathew Norman which neatly sums up all we have fought over and written about over the last two years...(search 'Betfred' on this blog). Also see the Deptford Betting Map (please email any inaccuracies). What with New Capital Quay almost complete (the new Waitrose will open next month), and more mammoth towers and blocks at Creekside Village waiting in the wings, it seems Creek Road is about to alter beyond recognition. Meanwhile, Family Mosaic plan to build along the Greenwich end of Creek Road, stretching from Bardsley Lane (next to the vintage clothes shop) down to Up The Creek, then from the Lord Hood pub over Bardsley Green (the patch of land with the car wash) down to Greenwich Book Place (the second hand book shop). The present building between Up The Creek and the corner of Bardsley Lane will be demolished. See the application 13/0364/F on the Greenwich website. 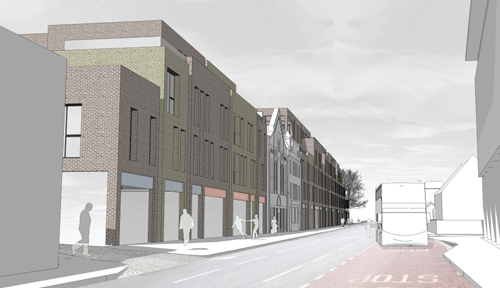 Although the impact on Creek Road is not ideal (bland and overshadowing), the designs for the back of the buildings, where it backs onto St Alfege's Park, look to be an improvement for Bardsley Lane itself. But that's easy for us to say since we don't live in the council estate behind. Both the Lord Hood and Up the Creek seem to be benefiting from the scheme, but we wonder if there are any benefits for the local residents in Bardsley House and Sextons House who will bear the brunt of the building works. Family Mosaic specialise in Shared Ownership (as well as building family flats on main roads, eg Blackheath Hill). 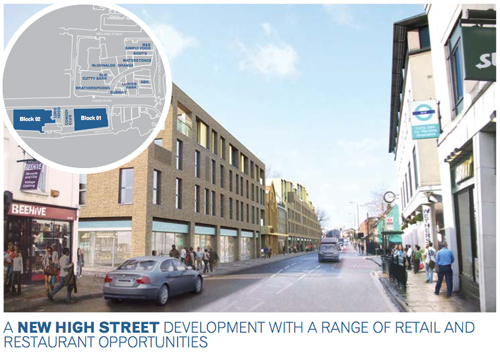 But out of the 83 units planned for the two sites on Creek Road (which will include ground floor commercial spaces to extend the shops out from the centre of Greenwich), only 29 are described as "affordable". However, at 34% this is far better than some targets being reached in the area. One good thing to come out of the New Capital Quay development is the planned bridge from the new development across the mouth of the Creek to Millennium Quay which will extend the Thames Path. 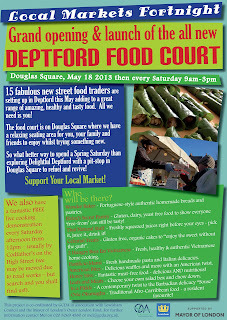 See the Deptford Dame's recent post. And here is the watchful mother. I haven't seen the male around for a while but I doubt that she'll get done for underoccupancy. This was a 3pm meal of worms al fresco served up too fast for my camera. 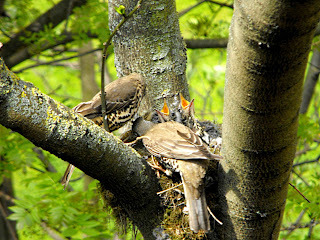 Watchful parent. I've seen 3 chicks but I think there may be a fourth. Though the lower one looks bigger and fluffier than the one above it (with a worm in its beak), they're very difficult to tell apart. The fluffiness is due to the fact that it's sitting. The other bit of (maybe not so good) news is that there is one unhatched egg in the nest. It seems to get moved around so it's not visible when I took the photos. made by old-fashioned football rattles'' is also characteristic of the mistle thrush. In my defence, I did say I'm not an expert! The three chicks appear to be doing well. The unhatched egg is either hidden from view at the bottom of the nest or it's been jettisoned. It's a bit blurry but I managed to capture an early bit of wing stretching this evening. 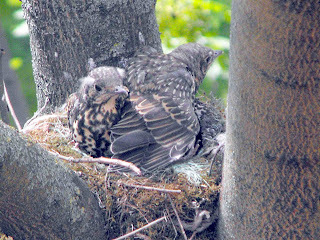 After a very stormy night I awoke this morning (10 May) to find that there were only 2 fledglings left in the nest. At first I was worried that the wind had carried one away but then realised that the remaining two were ready to leave. Amazing how quickly they grew - the first post was a little more than a week ago.